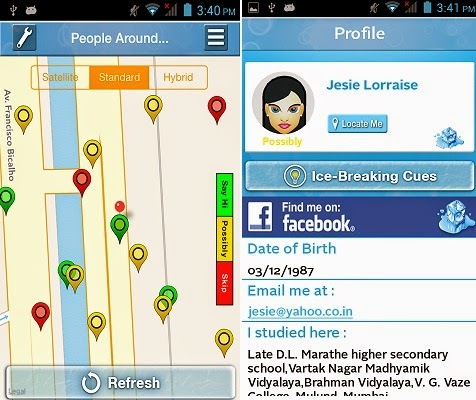 Ice Breakrr - Android App Review. It is not often we stumble across a totally new and totally COOL app, but this time Android Review Center has the scoop! We are very proud to be one of the first to download and review Ice Breakrr, and except the unfortunate spelling (do we really need to have bad spelling EVERYWHERE these days?!? ), not only did we totally like it, we also think this might be the next THING. Facebook and Google Plus, watch out. What is Ice Breakrr? Ice Breakrr is an Android App with a neat idea. The app scans for other active Ice Breakrr apps around you and then it gives you options on how to, well, break the ice. 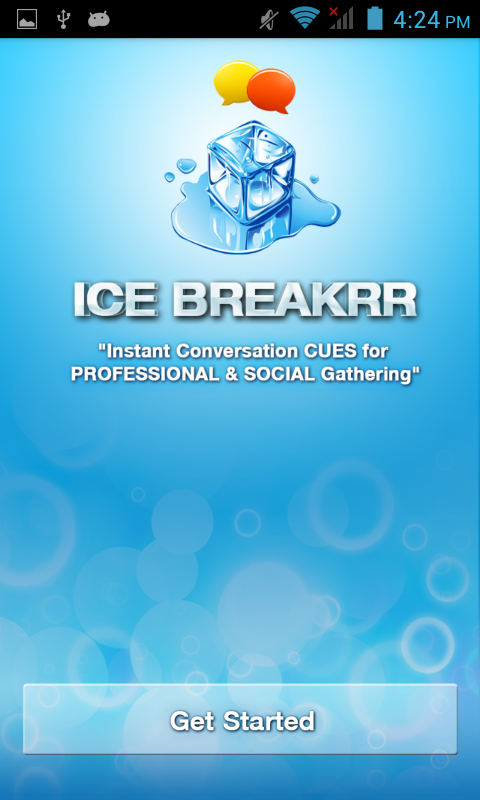 Ice Breakrr takes your info and that of the other active apps and it produces those oh so needed cues to start a conversation with the other Ice Breakrr owners who have the app activated. Ice Breaker will help you figure out common interests, common history highlights, occupation and much else, all for you to break the ice and start conversing with anyone who has the app active. Ideal for social gatherings, work gatherings, traffic jams, airports and actually anywhere that has people that want to start talking. So, what problems did we discover with this app? What are its drawbacks? Well, installation and setup were simple and fast, no hassle and no trouble. The Ice Breakrr app wants you to connect with your social network profiles to have the info it needs to work its charm. None of our reviewers had any problem running the app in an number of gatherings, including at their work places. Even our most technological challenged reviewers enjoyed this app. As a side note, we keep a number of grandpas and grannies on hand for these. We usually get very interesting feedback from them. Finding relevant contacts was pure and simple, with a clear map display that showed us where the other active Ice Breakkr apps were at. 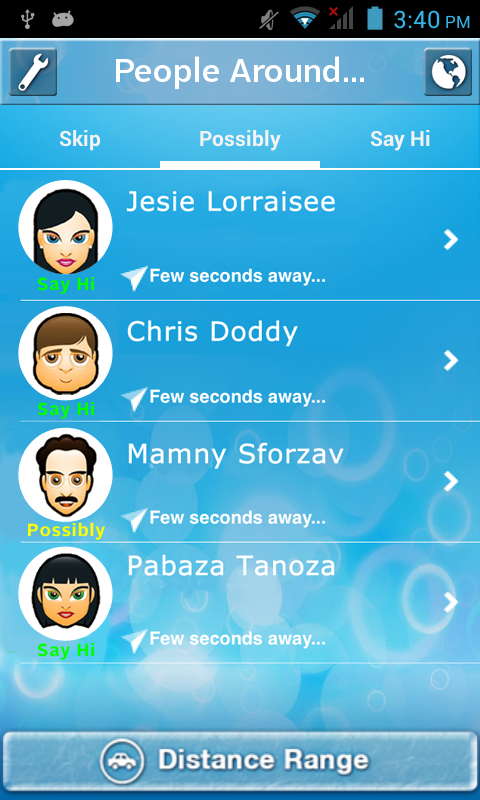 The lists of persons to contact, the profiles and the cues the app provided were perfect. None of our reviewers complained. In fact, most found the app slick, fast and very well designed. So, what are the app's disadvantages? Actually, the only thing going against the app is that its a new one. Not enough people have downloaded and activated it yet. Here we must beg of our readers: Go and download it! Spread the word! Our conclusion is the idea is great, the app itself is very friendly and easy to use and we really think this is the next new thing in the social networking world. And a last thought: Since the app is so new, YOU can break the ice manually by asking people to download it and experience it themselves! Score: 4.75. Great idea, slick design and much needed functionality. It would get a perfect 5.0 in a few months when everyone would have it installed. Description: A social networking helper app that displays other active installations of the app and cues to help break the ice. Good Points: Easy and simple setup. Slick design. Simple map and really smart and surprising ice breaker cues. Bad Points: None, really. Just make sure people download it! It's in your hands! Spread the word! We also didn't like the fact it needs Android 4.0 since there are still people going around with Android 2.2 and 2.3. Experience: Our reviewers liked it, even ones that aren't so quick to grab new technological ideas. Interestingly, even the reviewers who aren't really shy liked this app a lot. Longevity: It's so new we couldn't really comment on that but all our reviewers swore they're keeping it on their smarphones even after the reviewing period.